An endless day uses Google Ngram Viewer, a statistic tool used to evaluate and compare the recurrence of words in the books scanned by Google Books. Here, the intervention simply consists in the search of two words: “sun” and “horizon”. 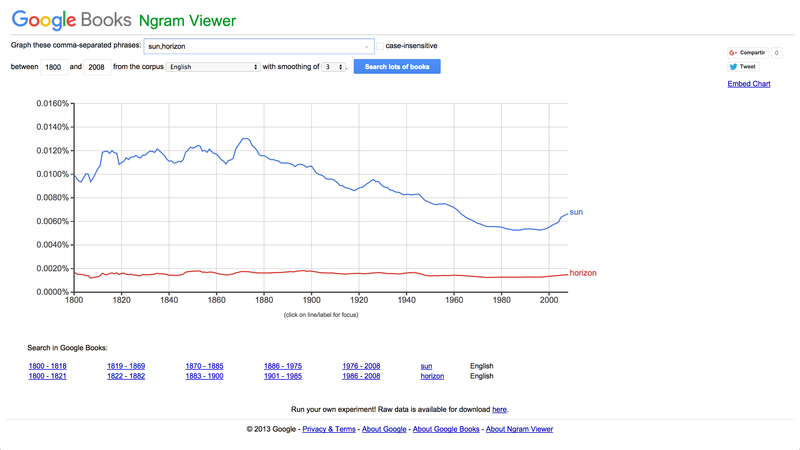 The searching parameters – historical period, corpus, etc. – keep their default values. The curves that result produce a minimal, but yet archetypal, landscape picture: an horizon, a mountain range – as much as a narrative, in which the only event is that the sun never sets. Playing with this temporal dimension, the artwork remains perpetually ongoing. Indeed, the amount of books scanned by Google increases constantly. So, a new printscreen is shot and printed for each new exhibition of the work. Carine Klonowski was born in 1989 in Nice, France. She currently lives and works in Paris. Her works tackles questions about the image and its contemporary modes of reception transmission and duplication, through questioning and manipulating its essential characteristics: light, colour, time, figuration, abstraction. She principally works from photographs that she uses as a material for her videos, performances, installations or her publications. In parallel with her artistic work, she was involved with an art and literature research program at the University Paris VII, between 2013 and 2016. After a first thesis on sunset, her work as a researcher is now focusing on coloured gradient and its use from classical painting to today’s practices in art, communication and marketing.